We’ve been testing the Avila pack from Hydrapak for a few weeks now and have been pleased with it’s performance. We received the pack as a sample from Hydrapak and our testers have used it on multiple runs up to 7 miles with solid results. 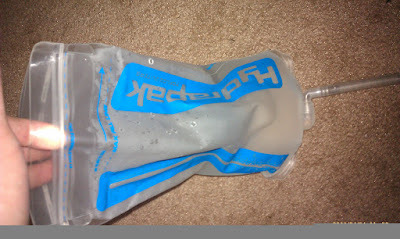 Hydrapak is, not surprisingly, a hydration company. They make a number of different packs and bottles for a variety of applications, including running, ultra-running, cycling, mountain biking and hiking. The Avila is a ultra light pack designed for runners. The pack is made of ultra light material and features SHUMS, Speed Harness Ultimate Mobility Straps. You’ll find the reservoir insulated to keep things cool and a clip for your keys. The pack also includes a number of reflective bits to increase your visibility. 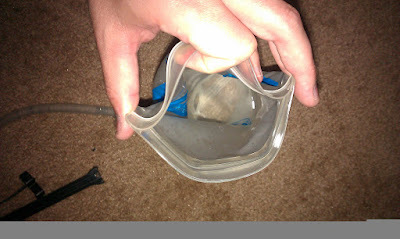 The pack only weights 7oz empty and has a bit (40 cubic inches) of storage. The reservoir holds 70oz of liquids and the pack is available in a number of different colors. We allowed one male and one female to test the Avila from Hyrdapak. Both runners used the pack in a number of different distances and situations. Our test distances were between 5K and 10 miles. We never filled the reservoir to it’s limit; the most we carried was 50oz. We also carried a few gels on the shoulder straps. The first thing testers noticed about the pack is that it’s lightweight, especially when you consider the liquid volume it carries and the available storage space for other goodies like food, gels, and cellphones. In addition to being light, the back is well ventilated. Shoulder straps are mesh and the actual pack footprint is small, so there’s not a lot of material to trap heat. The Avila is designed as a minimalist pack and it is. Our main complaint about this pack is it’s not designed for runners with a large chest. Our male tester is a 6’1, 240 pound Ironman with a 48″ chest. The pack fit just fine across his back and shoulders, but the chest strap was simply not comfortable. On one run, when fully cinched, the chest strap popped from it’s guides. Easily fixed, but not being able to tighten the pack enough allowed it to bounce more than expected. Our female tester has a large bust and it took her a few tries to get the pack situated, though it was possible. Hands down, our favorite feature of this pack is the reservoir. The bite valve works great and features a shutoff integrated into the end, not a knob like many CamelBak packs. The highlight of the reservoir is how you fill it or clean it: the entire top opens to allow you to fill, and clean, the reservoir. If you’ve ever tried to clean Gatorade out of your hydration pack, you know this is challenging. We continue to test the Hydrapak Avila and will report back in about a month with our final test results.